A plate from a book from the 1890s showing the internal mechanism of a typical windmill. A windmill is a machine that converts the energy of wind into rotational energy by means of vanes called sails. 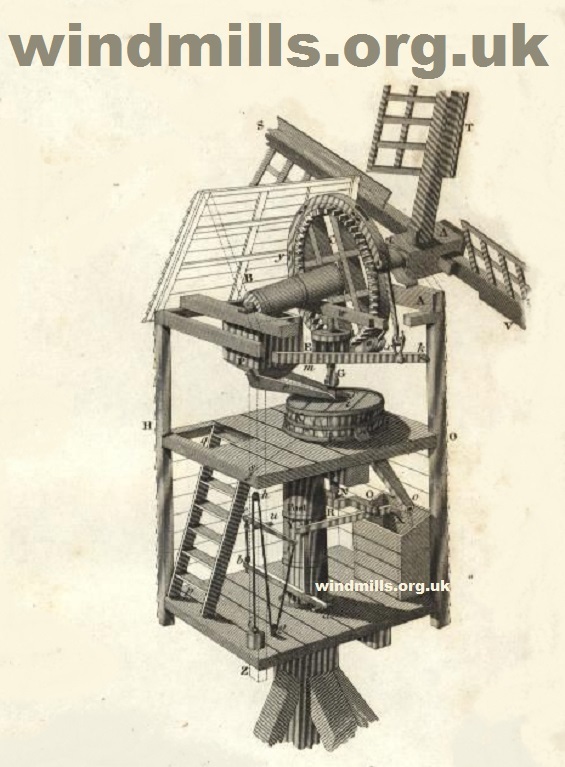 The reason for the name ‘windmill’ is that the devices originally were developed for milling grain for food production; the name stuck when in the course of history, windmill machinery was adapted to supply power for many industrial and agricultural needs other than milling. Common sails consist of a lattice framework on which a sailcloth is spread. The miller can adjust the amount of cloth spread according to the amount of wind available and power needed. In medieval mills, the sailcloth was wound in and out of a ladder type arrangement of sails. Post-medieval mill sails had a lattice framework over which the sailcloth was spread, while in colder climates, the cloth was replaced by wooden slats, which were easier to handle in freezing conditions. The jib sail is commonly found in Mediterranean countries, and consists of a simple triangle of cloth wound round a spar. The majority of windmills have four sails. Multiple-sailed mills, with five, six or eight sails, were built in Great Britain (especially in and around the counties of Lincolnshire and Yorkshire), Germany, and less commonly elsewhere. Earlier multiple-sailed mills are found in Spain, Portugal, Greece, and Russia. A mill with an even number of sails has the advantage of being able to run with a damaged sail and the one opposite removed without resulting in an unbalanced mill. Gears inside a windmill convey power from the rotary motion of the sails to a mechanical device. The sails are carried on the horizontal windshaft. Windshafts can be wholly made of wood, or wood with a cast iron poll end (where the sails are mounted) or entirely of cast iron. The brake wheel is fitted onto the windshaft between the front and rear bearing. It has the brake around the outside of the rim and teeth in the side of the rim which drive the horizontal gearwheel called a wallower on the top end of the vertical upright shaft. In grist mills, the great spur wheel, lower down the upright shaft, drives one or more stone nuts on the shafts driving each millstone. Post mills sometimes have a head and/or tail wheel driving the stone nuts directly, instead of the spur gear arrangement. Additional gear wheels drive a sack hoist or other machinery. 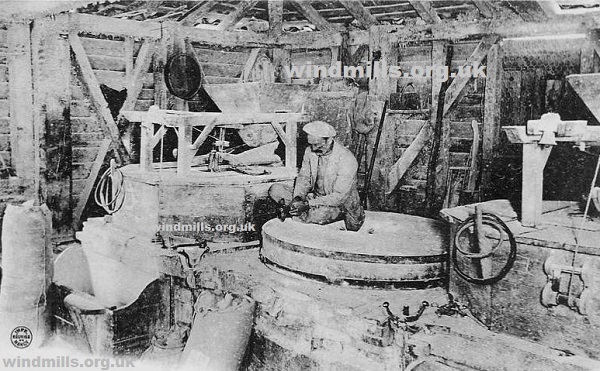 The machinery differs if the windmill is used for other applications than milling grain. A drainage mill uses another set of gear wheels on the bottom end of the upright shaft to drive a scoop wheel. Sawmills use a crankshaft to provide a reciprocating motion to the saws. Windmills have been used to power many other industrial processes, including papermills, threshing mills, and to process oil seeds, wool, paints and stone products. An old photograph in our archive of a miller at work in the very first years of the twentieth century.